Discussion in 'Online Games - News and Reviews' started by Marina, Jul 11, 2016. The real money gaming space just got hotter with the launch of Queen of Riches Video Slot, a 6 reel, 4 row slot from Big Time Gaming. The Sydney, Australia based games developer has introduced a novel way of increasing the odds of landing lucrative matched-symbol combinations. 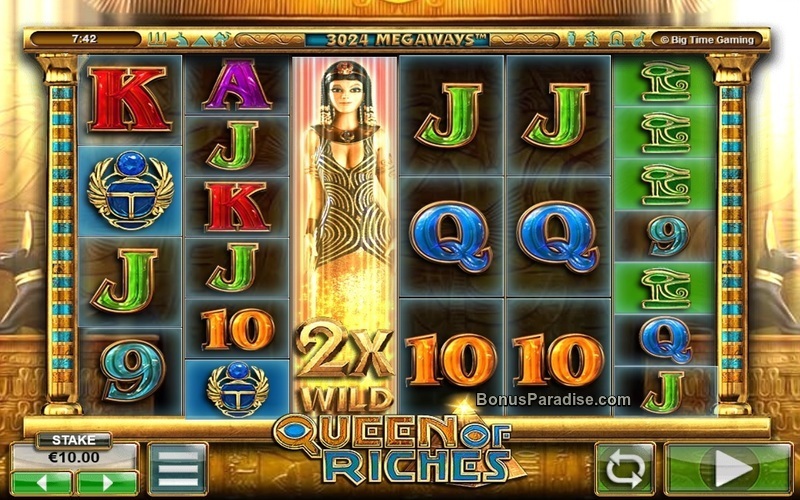 Queen of Riches is an Egyptian themed slot. Each of its six reels has a number of icons that produces as many as 42 symbols and up to 117,649 ways to win. That gives slots enthusiasts plenty of reason to spin the reels and take home a decent fortune. The reels can produce between 3 and 7 icons the outcome of every spin. This includes 7-symbol high Wild Reels. With it comes the potential for some pretty high paying winning combination after each spin especially if any of the ways to win is achieved with Wild symbols. 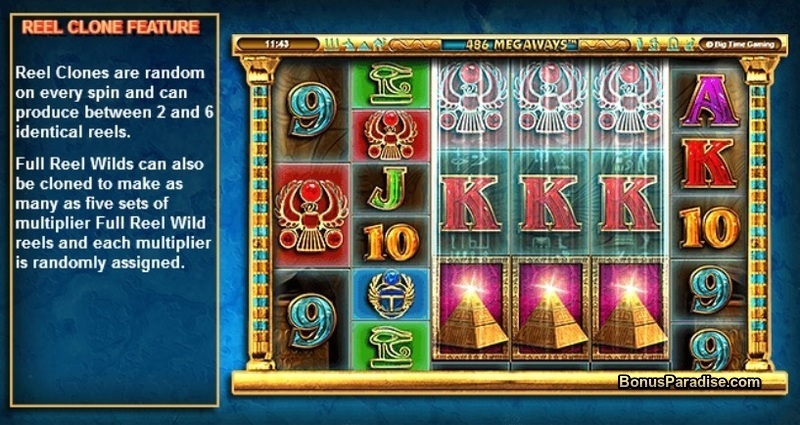 The symbols are common to several Egyptian themed slots and include the Eye of Horus, a pyramid, scarab broach, Ra jewels and card symbols 9 through to Ace. The Queen symbol that turns into a full reel wild that is the star of the slot. This results in up to 7 icons high with a whopping 7x multiplier. While the slot lacks a free spins bonus game it makes up for it with the Free Reel Random Wilds. So what happens with the free reel wilds is that when the Queen symbol fills the entire reel it counts for up to 7 icons and substitutes for any other symbol. If you land a winning combination the wilds will multiply up to 7x. In addition, full reel wilds multiply each other in the same winning combination. 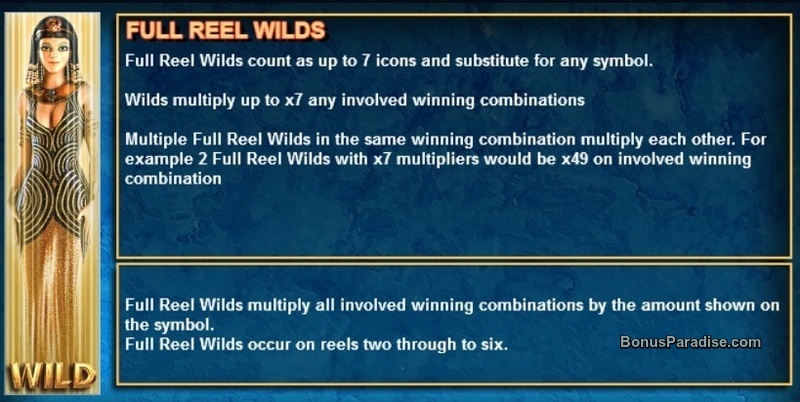 So if you land 2 full reel wilds with 7x multipliers this would result in a 49x multiplier on the winning combination, leading to some big wins. Adding to the excitement is the Reel Clone feature. This is where the reels may be cloned randomly on each spin and has the potential to produce between 2 and 6 identical reels. The Full Reel Wilds can also be cloned to result in up to 5 sets of randomly assigned multiplier Full Reel Wild reels. Queen of Riches is new to the online arena but has managed to gather plenty of attention in its first few days of launch. This is part of Big Time Gaming’s MEGAWAYS™ portfolio of games. Big Time Gaming has its headquarters in Sydney and is licensed and regulated by several of the top iGaming jurisdictions that include Alderney, Malta and the UK Gambling Commission. opportunities to hit the big pot, which is evident with its RTP of 96.90%. Coin sizes begin from 0.2 up to a maximum of 40, making it a slot for every budget. The game also comes with the Autoplay option for those who wish to keep the reels spinning while they get about doing other stuff. Queen of Riches is available at Betsafe Casino, Leo Vegas Casino, Unibet and more Online Casinos. This slot is really great. For players who love the feature in Twin Spin they must try this one too.